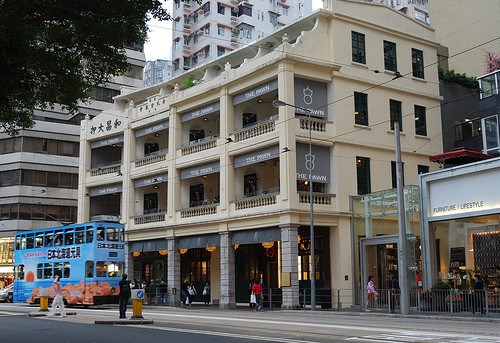 Located in a 100-year old former pawn shop alongside the tram tracks in the bustling Wan Chai district, The Pawn is one of a number of newer restaurants in Hong Kong that promise (and mostly deliver) standard British pub food done well. On Friday evening, the entire group of Xangans plus two partners and another visiting friend (who, coincidentally, is a long-missing-in-action Xangan) gathered around a second floor table located on a balcony with a street view. 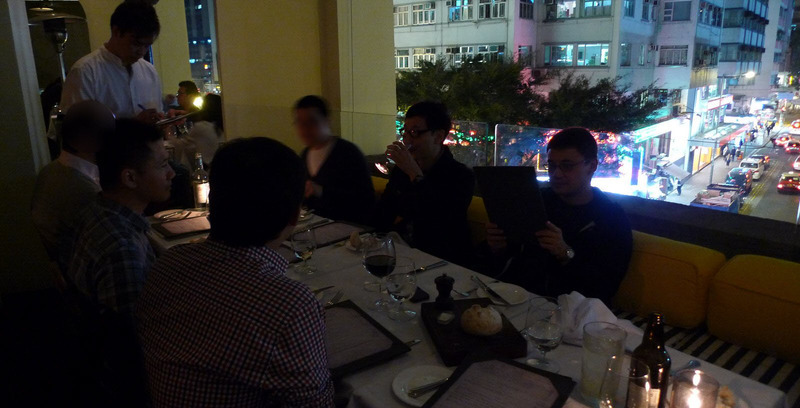 Because of the desire for privacy by a number of the diners, certain faces have been obscured. The atmosphere is nice and service, like most in Hong Kong, is spotty. When one of our diners asked the waiter for a suggestion of a drink with vodka (or something like that), the waiter replied, “The drinks are in the menu.” Very unhelpful. The menu itself is interesting and decidedly meat-centric. We ordered several starters and opted for larger mains designed for sharing. Glazed pig cheeks with apple cider, mustard seeds, and warm potato salad garnished with a crispy sliver of fried pig skin. This was a well-prepared appetizer with classic flavors. Nothing cutting edge but certainly enjoyable. We also had a roast chicken risotto with thyme and sage crumble, quail egg, and sweet onions. Risotto is always a treat, although this one (as with so many others) was too firm. 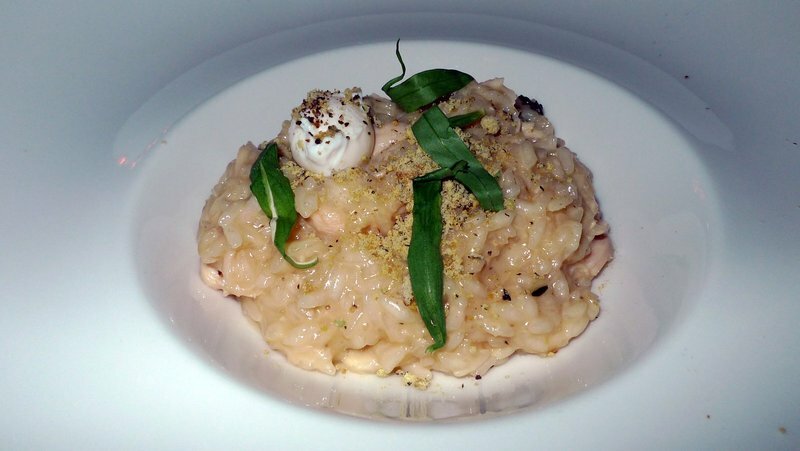 A real risotto should be soft and spread out on the dish. Flavors were fine, though, and the rice was properly cooked. 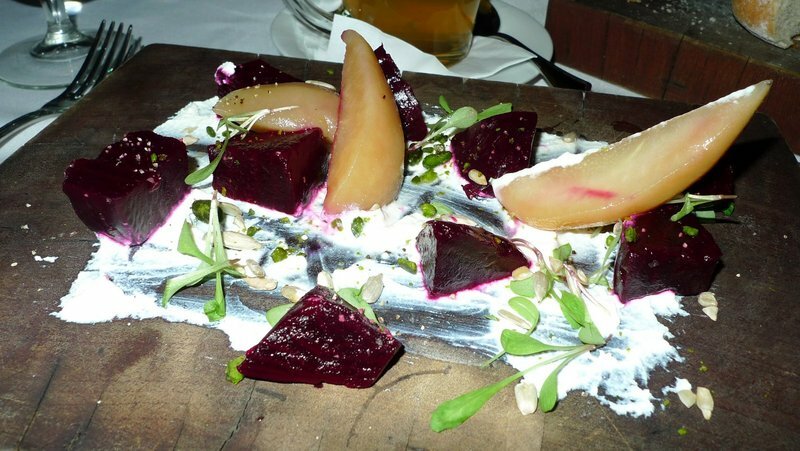 The organic beets, ricotta cheese, pear, pistachio, dandelion leaves, and sunflower seeds arrived on a weathered serving board in a presentation right out of Jamie Oliver’s “30 Minute Meals”. It was difficult to tell whether the chef was trying to be rustic or artistic. Again, the combination of flavors was nicely autumnal although a bit more seasoning would be nice. A main dish of macaroni bake with Shark Bay crab in champagne cocktail sauce, topped with toasted Gubbeen cheese served as a reminder that one should under-promise and over-deliver, not the other way round. The pasta was gloppy, the crab nearly absent, and the “champagne cocktail sauce” was indistinguishable from a typical cream sauce. 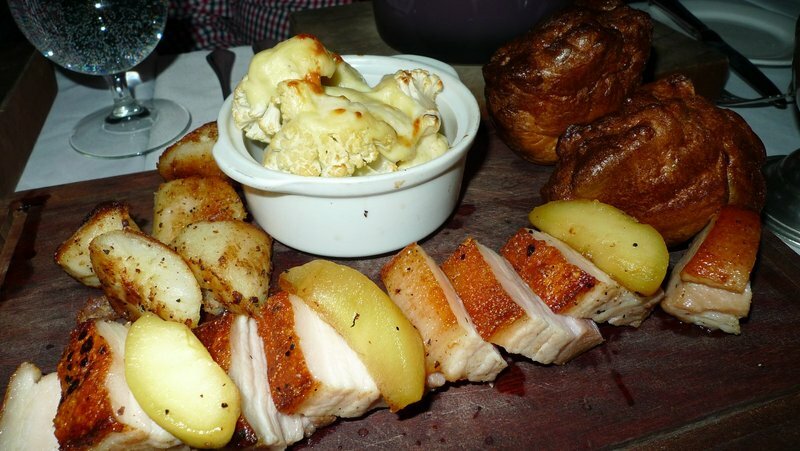 We ordered a trio of roasts which are suitable for sharing. 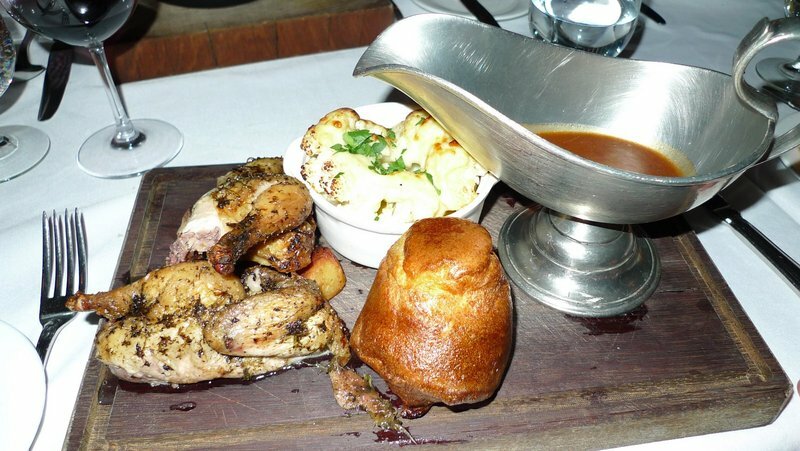 All are served in proper British fashion with crisp Yorkshire puddings, a side of cauliflower and cheddar cheese bake, duck fat-roasted potatoes, and an oversize boat of gravy. This was the whole young chicken with smoked garlic and marjoram. It was a nicely done chicken, juicy and tender. This was the lamb shoulder with sticky redcurrant sauce. It was nicely cooked, pink but not underdone, and had loads of flavor. 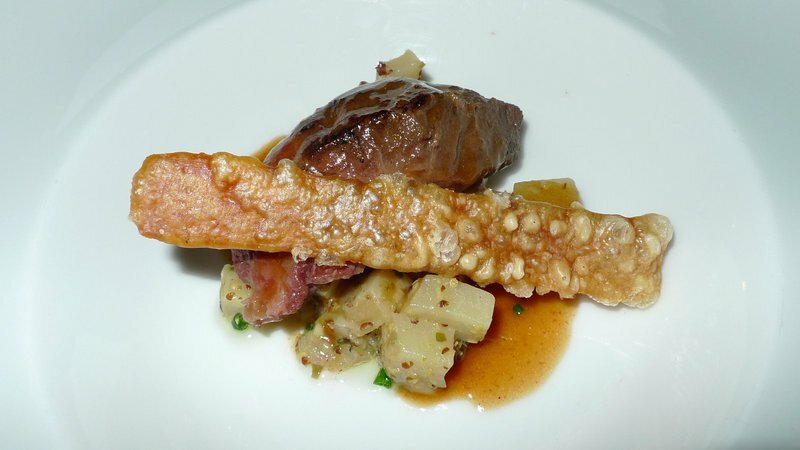 The Berkshire pork belly with caramelized Granny Smith apples was also tender with crispy skin. The fat was nicely rendered and meaty – not too squishy in the way that excess fat can be. The apples were a little scarce, another few slices would have been nice. On all the dishes, the quantity of potatoes seemed stingy for dishes designed for sharing. Finally, the naturally reared (whatever that means) Cedar River sirloin with sage slow-roasted onions. Didn’t see the onions, though, just some cabbage and mashed potatoes. 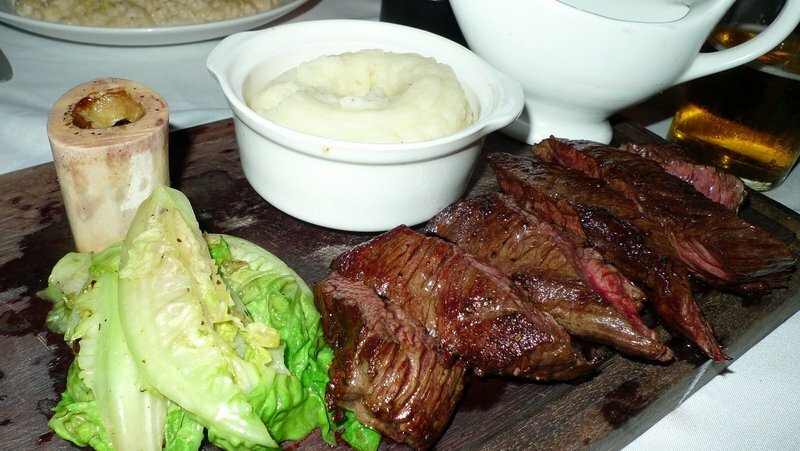 Still, the meat was well-cooked and surprisingly tender for a sirloin. For all of the mains, the preparation was competent even if there was little that was groundbreaking about the menu. 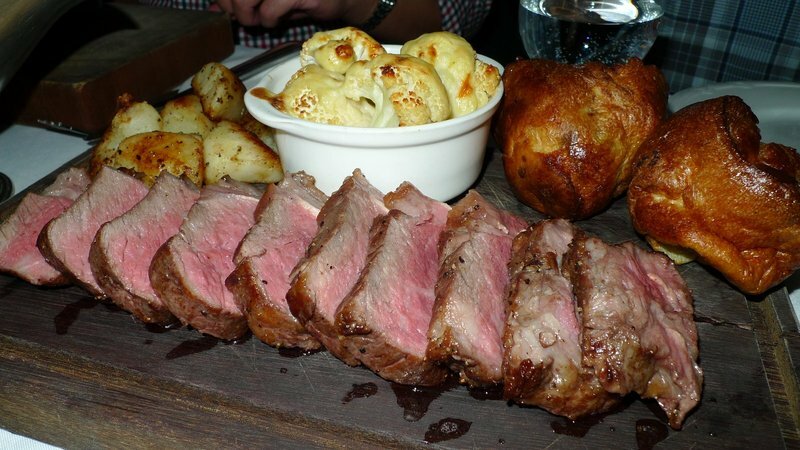 For a restaurant setting out to be a traditional British gastropub, they fulfill their promise. Even if you leave uninspired, you leave satisfied. The dessert menu turned out to be the spot where the inspiration was hiding. While the dishes remained simple, there was greater playfulness and creativity. 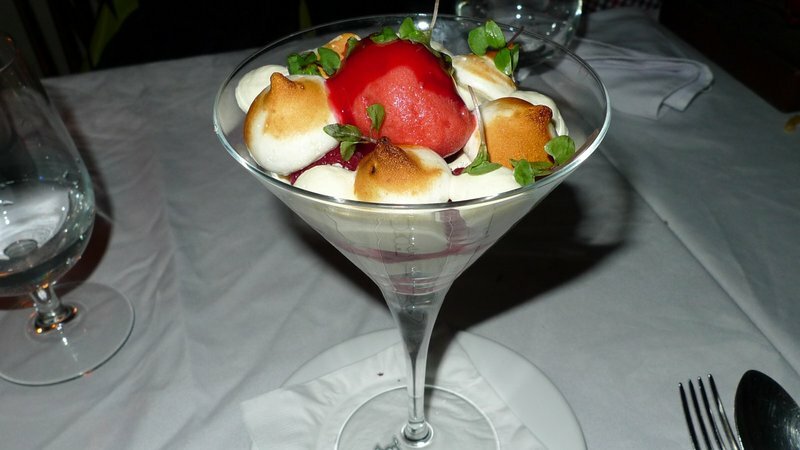 A clever take on Eton Mess, one of the most classic of English desserts, arrived a martini glass filled with small toasted meringues, rich raspberry sorbet, clotted cream, and delicate Thai basil leaves. Using individual meringues instead of a larger meringue broken up, made for an eye-catching presentation and the basil leaves added a delicate perfume that elevated the dish. 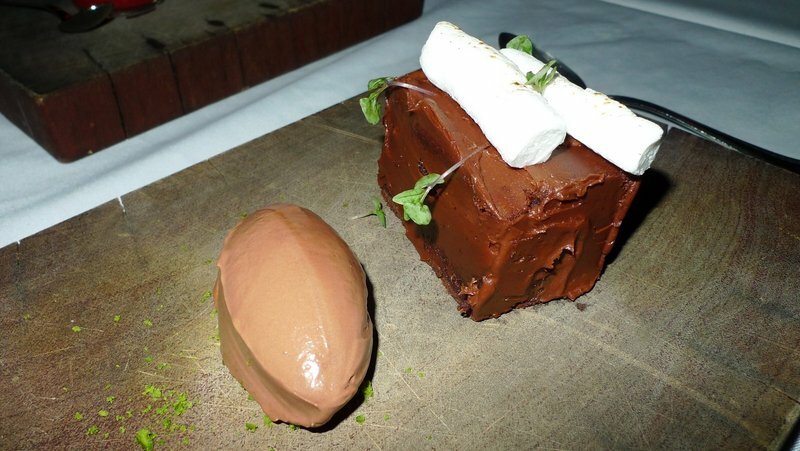 A chocolate fudge pudding was properly rich without being monolithic. The malt chocolate sorbet provided an interesting contrast in chocolate tones and the toasted homemade marshmallow and dusting of pistachio crumbs were perfect accompaniments. 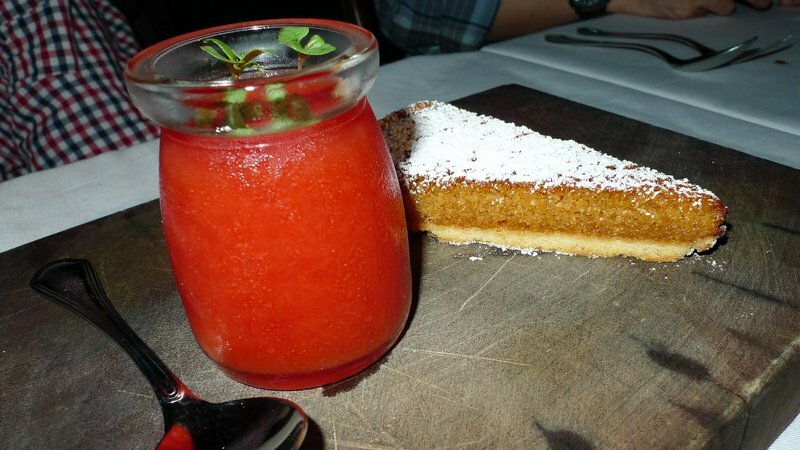 One of the “more than meets the eye” desserts was this treacle tart. Treacle, a golden sugar syrup not unlike Karo corn syrup, makes for a sweet and crisp tart that is essentially a pecan pie minus the pecans. In and of itself, it is crisp but otherwise uninteresting. Add to it a scoop of the blood orange jelly and your taste buds are sent to another dimension. The jelly is sweet, tangy, and brings out the slight saltiness to the tart. Excellent combination. 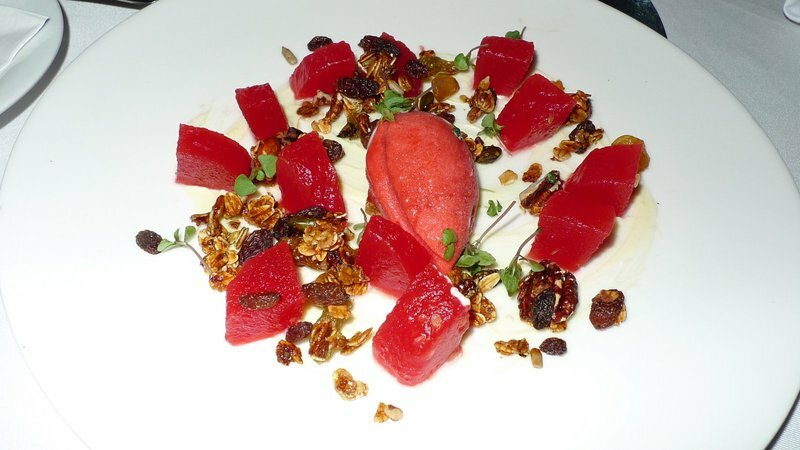 A final dessert, leaning towards the modernist edge of plate design, was the watermelon, white chocolate, strawberry sorbet, and granola. The watermelon was, I think, compressed. Each piece was firm, seedless, and bursting with concentrated watermelon flavor to a degree one could never find in a simple slice of melon. The effect was intense and the combination of flavors and textures made for a satisfying finish even if the plate itself was a bit of a mess. Overall, the Pawn turned out to be a good choice for dinner and will be on my to-return list next time I am in Hong Kong. This entry was posted in Uncategorized and tagged Dining, food, hong kong, Pawn, Restaurant, thePawn by christao408. Bookmark the permalink. Very interesting menu! I am certainly ready for lunch now. They do to work on their presentation but based on your description, pork belly and the tart are calling to me. I just got up late and I would eat the sweets but not all the pork. lol Hey, what are you doing in China? Oh, that beef looks good! I haven’t had a good steak in forever. The watermelon sounds very interesting. Oh my… the food looks really good. The carnivore in me is growling and salivating. It’s too bad the service was a bit spotty. If the waiter didn’t know what to recommend he should get someone that could help. I’m a bit leery about using those wooden boards as plates. Sometimes the kitchen don’t clean them that well.p.s. I wish those long missing in action Xangans would return. Looks like a lovely English pub! 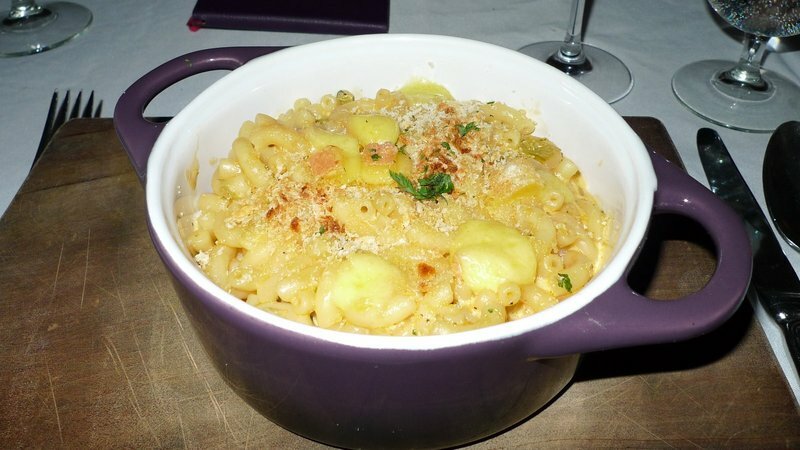 I don’t think I’d have ordered Mac & Cheese in any incarnation. I like to order things I can’t make at home – better. The desserts look very tasty. I love the taste of watermelon but sadly it does not agree with me. I read this post then had to run down for lunch since it made me very hungry! Hope the company and conversation made up for what was lacking in the meal. I’ll definitely have to take another look at English cuisine. I thought it dull. At first I thought I read Prawn not Pawn. Still it was a great food outing and the lighting for the food was great. Usually service by a waiter is better than service by a waitress but usually the good waiters are busy serving their regulars.There is some debate whether or not wood surfaces is sanitary. I would suppose some of the tanins in wood would help keep down bacteria. That blood orange jelly with the pecan pie (sans pecan) got me thinking. I have a kumquat tree with an abundance of the fruit, and could make a jelly. Wonder how they’d pair up…. After a week I still remember the desserts especially the pecan pie without the pecan…..
What a wonderful spot to sit and share a meal with fellow Xangas and partners. The food looks wonderful and the view also.Have a wonderful week coming up way to fast. Great dishes and very appetizing…though I am not sure if I like the food on a cutting board. The desserts looked just grand. I don’t know what you mean by “compressed” water melon. You need to explain that to me. the pawn building looks different in day light. your pics of the food came out real nice, by the way. i’m loving your camera. i was unable to get the pics as clear with my crappy iphone. now that is great presentation!